The Golden State Warriors will host the Los Angeles Clippers on Monday night in Game 2 of this Western Conference first round clash. The Warriors (57-25, 30-11 home in regular season) were in fine form to start the playoffs, handing the Clippers a 121-104 beating in Game 1 a couple of nights ago. The two time reigning NBA champions were a bit shaky at times in the regular season, but still claimed the top seed in the West, and were always expected to ramp up the intensity once the playoffs began. That is what happened in Game 1 on Saturday. The Clippers (48-34, 22-19 away in regular season) have definitely overachieved this season. Without an all star caliber player, and in a very tough Western Conference, they were not expected to be near the playoffs at the start of the season. However, the Clippers were consistent all year and it became clear pretty early that they will probably be in the postseason (even if eventually they only claimed the 8th seed). But facing the Warriors in a 7 game series, that is a step too high for them. Bet on Warriors vs. Clippers and claim your 100% (120 Euro) freebet at LSbet now! Team news: Both teams are fully healthy ahead of Game 2 (aside from fringe center Damian Jones for the Warriors, who has been out since a long time and is irrelevant anyway). 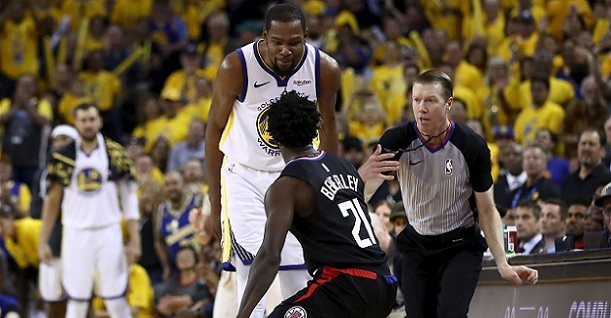 The Clippers are totally outmatched in this series, and not just because of the gap in quality, but because they do not match up well against Golden State`s style. The Warriros won 17 of the last 19 against the Clips, mostly by large margins. The last three meetings were won by Golden State by 18, 27 and 17 points respectively. Game 1 was an easy win by Golden State, and quite honestly they can play much better than they did in that 17 point win – mainly by limiting turnovers. They made 21 of them on Saturday, and are sure to focus more on taking care of the ball tonight, as players like Kevin Durant stated. The Warriors are just a different team in the playoffs, especially at home, and based on everything we know about these two sides, there seems to be little chance for the Clippers to keep this competitive. The Dubs waited all season for the playoffs to arrive, they are hungry and motivated, and in these conditions they are a monstrous team. They should hand LA another beating based on the gap in quality and the favorable matchup. My tip is Golden State to cover the 13 point (asian) handicap, this is a pretty straightforward bet for me. Prediction: Golden State Warriors – LA Clippers 128 – 105.